“I feel a presence of someone!” Pansy shouts. They’re sitting around a table, the three of them, touching each other’s fingers. 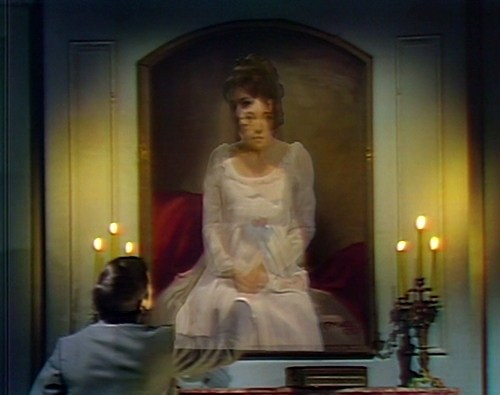 Kitty’s having portrait trouble, a common occupational hazard for Dark Shadows characters. There’s an oil painting in the foyer that keeps clearing its throat and shooting her meaningful glances, and after a while, that kind of behavior develops into a hostile work environment. The eyes in the portrait don’t just follow her around the room; they follow her all the way upstairs, and invite her out on compulsory dates. She’s been drifting around the estate, saying that she feels drawn to things, and the portrait says, I know, I was drawn too! We have so much in common! But when she comes to, she has no memory of the baffling things that she’s said and done, which is frightening as well as being a drain on her schedule. She’s tired of being bossed around by a painting, and has no interest in becoming an ancestor. So Kitty and Pansy and Edward get together to talk things over with the spirits, and then they blow out the candle, and make a wish. They were hoping to summon up an explanation. What they got was Judith Collins, bringing home the latest temporal projections. The grande dame of the great estate has been away on summer vacation for the last three months, locked up at Rushmore Sanitarium on a trumped-up charge. Judith has been absent for a huge chunk of the storyline, practically the whole third act of 1897. Count Petofi, Aristede, Kitty Hampshire, Amanda Harris, Charles Delaware Tate — these names mean nothing to her. She missed Woodstock and the Haunted Mansion and Scooby-Doo; I bet nobody’s even told her about the moon landing yet. So Judith has to reconnect to the show — opening the doors of life, as Vicki did, and linking her past with her future. And on Dark Shadows, the past is never quite the same as it used to be. So imagine coming home from a three-month stay at the insane asylum, and finding your house full of Pansy Faye. When Judith left, this was her step-daughter, Charity Trask, a prim young daddy’s girl with pulled-back hair and a penchant for tattling on people. Now Charity is inhabited by the blithe spirit of Pansy, the Cockney mentalist and music hall performer that Carl Collins loved and lost, all those months ago. This is why people who live at Collinwood should wear nametags, so you can keep track of who’s been possessed by what. Pansy: Whatcha lookin’ at me like that for? Judith: The way you’re dressed — all that paint on your face! Charity, what’s happened to you? Pansy: Pansy Faye’s my name, and nothin’s happened to me. I ain’t changed a bit, since the day Carl brought me to this ‘ouse! Judith: The day Carl brought you? Pansy: And I ain’t forgot the way you treated me then. Wasn’t good enough for you, was I? So it’s going to take a minute for Judith to make the necessary adjustments in her outlook. Charity becoming Pansy is already a lot to take in, but this is Collinwood; people become things. The real surprise is that Pansy is postulating a past that didn’t happen. Yes, if she’d had the chance, Judith would have treated Pansy badly. But when Carl came home from Atlantic City with salt water taffy and an unsuitable fiancee, he was apprehensive about springing the news on his family with no warning — so he stopped at the Old House first, to ask Barnabas for help. Demonstrating her psychic abilities, Pansy went into a quick trance, where she received a completely accurate warning of immediate danger. Before you knew it, a vampire came along and killed her. Pansy never visited Collinwood, and she never met Judith. She was dead by the end of her first episode. Later on today, Pansy has a moment to reminisce about the introduction to Collinwood that she never actually had. “It’s such a lovely house,” she says. “I remember saying that to Carl, the first day he brought me ‘ere. He was so excited and proud, showing the place off to me!” None of this is true. This is somebody else’s backstory. They’re thinking of Jenny, the wild-eyed singer that Quentin brought home. She’s the one that Judith mistreated; it was Jenny’s green dress that Judith stole, after locking her up in the tower room. Coming home from her lengthy confinement, Judith has arrived at a house that isn’t quite the one that she left. She stares at Pansy, feeling the world shifting beneath her feet. And that’s not the only inconsistency that Judith experiences, not by a long shot. There’s also the question of who came to see her at the Sanitarium. Edward is surprised that Judith came back alone; when she showed up at the door, he assumed that Reverend Trask brought her home. 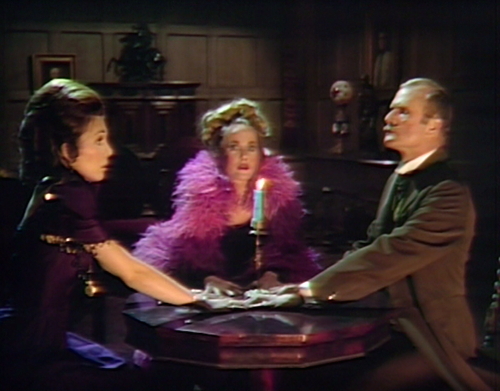 They hash out this misunderstanding over the course of the next few episodes, presenting three alternatives: the world where Trask was the devoted husband, spending his days caring for his stricken wife; the world where Trask was a liar and a cad, doing God knows what behind his wife’s back; and a third option, invented by Trask on the fly, where he visited the Sanitarium regularly, but the doctors wouldn’t let him see her, because they said it would interfere with her treatment. Edward and the audience are led to believe that the liar and cad version is the real story, but in a world where Carl showed Pansy around a house she never visited, why should we put our faith in one option? Judith’s homecoming could be generating areas of instability all over the place. After all, we never saw the Sanitarium, and we don’t know what her treatment was like. Maybe her psychiatrist was Dr. Haber, who directed her dreams with a prototype Augmentor, like in The Lathe of Heaven. We know that Judith’s troubles began with a frightening dream about her husband’s first wife, and then Minerva started showing up in the house — an alternate possibility just sitting there in a chair, paradoxing. Maybe Judith’s having effective dreams, and Dr. Haber’s been using them to shape the world. Maybe Trask really did visit the Sanitarium, and started asking difficult questions about the Augmentor, and Haber made her dream him away. Maybe Judith is the only one who can remember the world, the way that it used to be. It’s actually past midnight, according to Friday’s episode. Kitty had already blown the deadline before she went to the Blue Whale to talk to Pansy; that was hours ago. Pansy started the seance at midnight. It must be around 12:15 right now, give or take a weekend. But there are always areas of increased slippage in the immediate area around the time paradox. According to Mr. Dunworthy, this is how the net compensates for mistakes made by time-traveling historians; it’s all related to the Bishop’s bird stump, and the Nazis bombing Coventry Cathedral. After a while, Judith starts turning these time differentials to her advantage. She wants her step-daughter to move back into the house, even if she’s currently a different step-daughter. But it’s not up to Pansy to choose her own backstory. Judith’s got the Time ring, and she’s altering Pansy’s genetic development, so she evolves into a less aggressive creature. That hits home. Pansy’s established a new, jolly father in Bertie — but her mother is still up for grabs, and Judith just grabbed it. It’s not clear which mother Pansy’s thinking of. Is she picturing Minerva Trask, or the lady who married old Bertie Faye? Or is this a manifestation of Judith’s effective dreaming, merging the two? 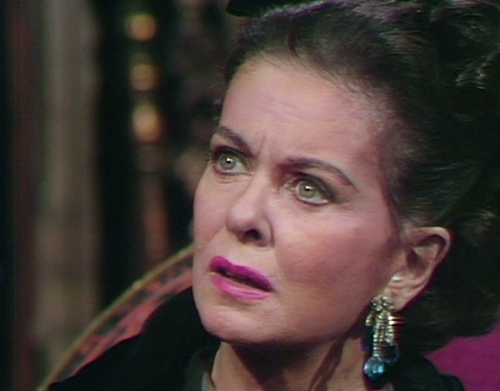 Rewriting people’s family history is nothing new for Dark Shadows; that’s basically the only thing they ever do. But access to the edit button is a gift usually given only to the time-active characters: Barnabas, Julia, Angelique and Vicki. Suddenly, a civilian wound up with the keys to the Augmentor. There’s one more display of Judith’s casual time-manipulation today, and it’s the most mysterious one. Once things quiet down in the drawing room, Count Petofi enters and introduces himself, and Judith says, “Of course! I’ve heard Edward speak of you.” So that’s another thing to throw on today’s pile of things that didn’t happen. When Count Petofi showed up a few months ago, he brought a letter of introduction from the Earl of Hampshire; he’d never met Edward before. And even then, he was traveling under an alias — Edward thought his name was Victor Fenn-Gibbon. “Count Petofi” was an old gypsy legend, until he showed up under another name. The idea that Edward brought up the name in conversation is pure applesauce. But here’s Judith, cutting and pasting as she pleases, and this time, she’s rewriting history just to smooth over an awkward social exchange. Or is there something else going on? 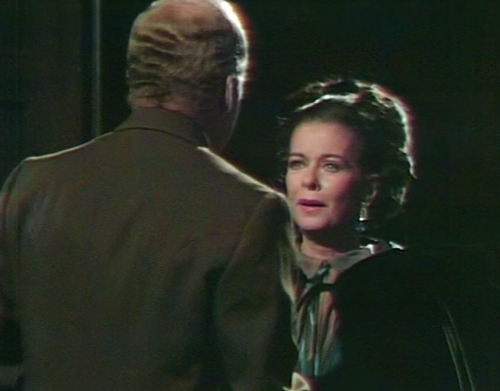 She’d never heard of Petofi before she left, but Judith is walking into the advanced stages of a full-fledged Time War. Barnabas was sent to 1897 Collinwood on a mission from the Time Lords, to prevent Quentin from becoming the angry poltergeist that he now won’t be. But — Who knew? — stepping on butterflies has unintended consequences, especially six-foot-three butterflies with a hit record. Now the Doctor is racing against the clock to prevent the Mad God of Ozhden from becoming time-active. Count Petofi, newly regenerated in a Quentin-shaped suit, is determined to learn the secret of time travel, which he thinks is only possible with the correct I Ching hexagram. But as we know, there are plenty of other available routes through time. Vicki traveled by seance, and Angelique cast a spell that sent Eve on a round trip to 1796. At one point, Barnabas traveled back in time just by standing in the graveyard and thinking about it really hard. Plus there’s staircases through time, and Leviathan altars, and dimensional fissures and what all. Even the hapless Peter Bradford figured out how to jump through the centuries, using a combination of flashbacks and frowning. But there’s a non-proliferation agreement among the major characters, to deny Petofi access to this knowledge. He’s too dangerous for time travel. The Collins family doesn’t need another irresponsible time agent messing around; they barely survived Vicki. And now there’s Judith Collins, recent graduate from the Rushmore Sanitarium, and we foresee a Time-stream where she becomes the dominant creature in the Universe. Somebody needs to look into this, starting yesterday. Today’s post includes references to four other tales of the Time War. Dr. Haber and the Augmentor are from Ursula Le Guin’s The Lathe of Heaven; Mr. Dunworthy and the net appear in Connie Willis’ To Say Nothing of the Dog; the butterflies come from Ray Bradbury’s A Sound of Thunder; and the opening of this post is from Terrance Dicks’ novelization, Doctor Who and the Genesis of the Daleks. When Judith sends Edward out of the room to find Pansy, he exits the room and turns to the right, towards the study. About twenty seconds later, Pansy shows up, entering from the left, and says that Edward asked her to come in. 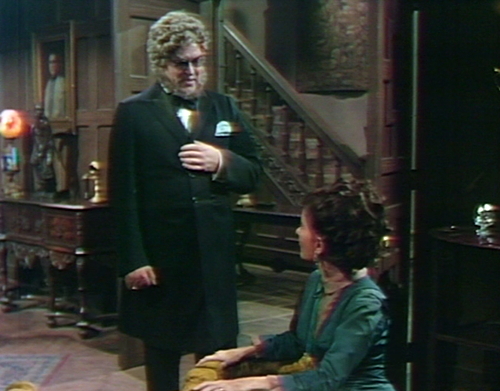 As “Count Petofi” enters the drawing room and approaches Judith, we see her sitting motionless for a couple seconds, staring into space and waiting for her cue. 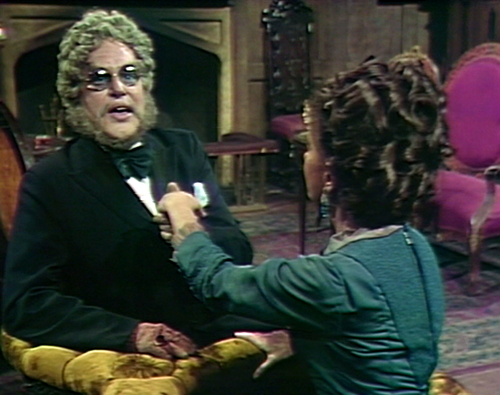 Longtime Dark Shadows stand-in Timothy Gordon returns today to play Jeremiah’s ghost. Gordon first appeared on the show in 1966 as an extra at the Bangor Pine Hotel Restaurant, and since then he’s played Zombie Jeremiah, Barnabas’ disembodied hand, a minister and a spectator at Vicki’s execution. We last saw him in July, as Petofi’s hand. He gets to speak a couple lines in tomorrow’s episode; I think that might be his only speaking role, although I’m not interested enough in that question to go and check. Timothy Gordon’s appearance in tomorrow’s episode is his last on the show; I don’t know what he got up to after this. His only other credit on IMDb is a 1964 Peter Sellers movie, The World of Henry Orient, where Gordon had an uncredited role described as Man Holding Towel Before Concert. The Mistress of Collinwood gets to decide whom she remembers and whom she doesn’t. Anyone who says differently can avail themselves of the lovely cliff diving facilities out back. Pansy never went to Collinwood but she did meet Judith at the Old House in Episode 771. Most of what she says matches with that episode. 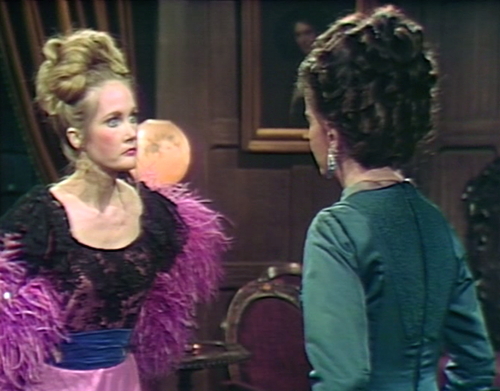 Judith is curt and dismissive to her, delivering a withering “I’m sure you do” when Pansy claims she has to wait for the music to enter her head. She tries to find the missing Dirk, and in her trance she says that someone in the room killed him. This is true, but as no one is aware that Barnabas is a vampire yet, they take it poorly. Judith storms out horrified. I love this part of the story when Judith starts getting revenge. Ahh, Joan Bennett. Stephen Robinson is absolutely right, Judith and Pansy did meet. 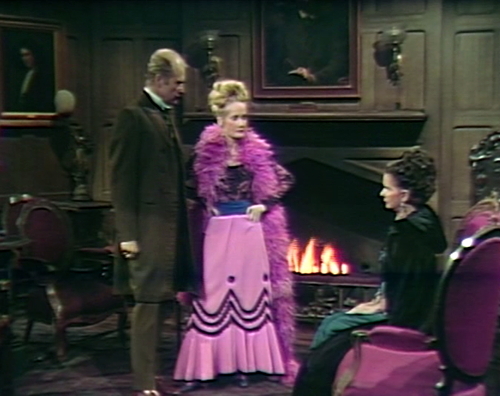 But Pansy never met Count Petofi (at least not on screen), so one has to wonder why Patofi chose to make Charity become possessed by the spirit of Pansy. It’s possible that Petofi didn’t specifically choose Pansy to possess Charity. If I recall, Petofi simply cursed the household members to assume their “true personalities,” or something like that. So I suspect Charity “became” Pansy because, deep down, she really wanted to be footloose and fancy-free of her father’s stifling control. But that opens up an even bigger conundrum: I don’t believe Charity ever met Pansy, either. So that suggests that, when Petofi “opened” Charity to becoming someone else, the spirit of Pansy Faye, floating around the premises of her demise, saw an opportunity, swooped in, and took control. Charity falls under Jamitofi’s “true self” spell, she seems to understand that she’s Charity Trask while behaving like Pansy Faye. It’s somewhat unclear. However, when Petofi later commands her to “begin a new life,” she is from that point, pretty clearly Pansy Faye. So, yeah, maybe Pansy’s spirit swooped in and possessed Charity. It’s interesting because Charity as Pansy knows that Barnabas killed Carl, which mostly happened because Carl was investigating Pansy’s disappearance but Pansy is almost willfully oblivious to information that would imply she’s actually dead (sort of like the SIXTH SENSE). Pansy is introduced as somewhat of a gold digger, so it always pleased me that she makes it clear while possessing Charity that she genuinely loved Carl. In supernatural circles, that’s called a “walk-in” – when a spirit steps into and takes over a vulnerable body. A famous case where such believers think this happened is the case of the woman who claimed to be the Tsarina Anastasia Romanov; they say that the woman, a Polish factory worker whose unconscious body had just been pulled from the river and revived, was possessed by the wandering spirit of the real princess. Whenever Count Petofi first met Lady Kitty, he would have been without his magic hand, which should mean that Kitty has never seen it before. The writers seems to have forgotten this, as Kitty is now terrified of the hand. I have to go with option #2. There’s an interview where Dan Curtis talks about how “on the nose” he is. He said he doesn’t “go against type”. When you’re a jet, you’re a jet all the way. If it looks like a cigar, then it is, and Reverend Trask is a liar and a cad and a total poopy-pants. 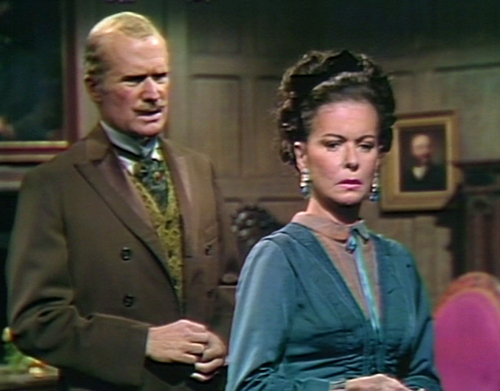 Regarding Edward having spoken of Count Petofi to Judith, it’s conceivable that he would have done so on his visits to her in the sanitarium, telling her what was going on at Collinwood. Having said that, Judith does seem to have a positive reaction toward him, and from the point Edward finds out Fenn-Gibbon is Petofi, I doubt he would have had as much good to say about Petofi. Petofi – after admitting his true name to Edward – convinced the gullible Mr. Collins that the count was on the up and up. Edward, still convinced that the only threat had ever come from Barnabas, allowed the count back into Collinwood. Since Edward was making regular visits to his sister at Rushmore, we can assume that he updated her on his latest assessment of Petofi. We do not know any of this for sure, though. The writers often leave us to do the heavy lifting in making sense of their mistakes.